The rich get richer, and the poor…. Well, when you’re a Tea Party-backed Republican and you’re crowing about your ‘victory‘ in the debt-ceiling deadlock, why should you care? After all, you stood in the landslide mid-terms on a ticket of no taxes and rolling back so-called ‘big government’, under a misguided sense of taking America back to Washington-era constitution, and after weeks of acrimonious argument and Capitol chicanery, you’ve succeeded in hijacking a process that’s hitherto been smooth and commonplace and turning it into a means to push America further to the right. It’s astonishing that, for an administration that still holds a Senate majority, this government can be held hostage by a group of politicians that, for all the aghast cries from dissenting Democrats, didn’t even support such a painful bill because the cuts were not nearly tough enough, and the compromises too weak. The likes of Ron Paul, Michelle Bachmann, who would sooner give up their right to bear arms than bring in tax increases for the rich, have come off best in a game of brinkmanship that played with the global economy as if it was a roulette table. While many thought that a deal would eventually be done, simply because it had to, it’s incredible to think that a President whose election ideals reached out to the poor and disenfranchised so much has now been forced to support a deal that must’ve felt like sucking vinegar, against everything he and many of his party stood for. So why did it come to this? The debt ceiling had to to be raised, as it had painlessly by countless Democrat and Republican Presidents before, but this time the Democrats, shorn of their House majority, had to face the fact that this time the vote would be made, by those on the far right, to symbolise the deep divisions on Capitol Hill. The GOP, so riven itself in conflict that on Friday its House leader, John Boehner, humiliatingly lost proposed vote simply to approve his own party’s plan, has managed to play a game of chicken, safe in the knowledge that however opposed to their plans President Obama was, he would most likely compromise in the national interest, something they would refuse at all costs. And what costs? While many doom mongers had forseen another 2008, the reality was that a US that couldn’t service its own payrolls could’ve sent the markets into turmoil, and yet Tea Party-backed Republicans and many more moderate in their party saw it as a viable alternative to many of their bete noires, especially that spectre of all spectres, tax rises for the rich. It’s a distasteful, unpalatable truth that many of these super-rich politicos see it as their divine right to save the majority of the wealth for the majority of the rich. Bush’s tax cuts, an abomination when they were brought in 2001, are staggeringly still here, making those with the most proportionally better off year on year. It was this unthinkable that saw the Right push back against a series of proposed Democrat plans that would’ve seen them take a hit along with many schemes designed to help the poorest – social security, education, Medicare, Medicaid – in favour of swingeing cuts that simply left them untouched. To a British citizen like myself, even with a Conservative-lead government, this seems an almost unbelievable truth. That a country as apparently welcoming and diverse as the United States, self-appointed global leader and trumpeter of its ideals, can allow this abomination to persist, in fact to be furthered is shameful beyond description. But this, to many on the Right, is the American Dream. You are responsible only for yourself, you reap what you sow, your success is yours alone to enjoy, and no-one, NO ONE, is going to deprive you of it. Perfect, if you’re a millionaire, but if you’re below the poverty line? Well, you just need to work harder. It comes as no surprise that the majority of these Tea Party-backed are white, middle and upper-class (yes, there are token minorities, there always are), and their supporters even more so, while all the poor are often black, many minorities. Well, they’re just poor because they’re lazy, or they don’t work hard enough, or they’ve not made their own opportunities. It’s one of the staggering conditions of the United States: try to redistribute wealth, to help using taxes those less well off than you? You’re a socialist. In a Europe where Obama would be, and is, welcomed with open arms for his lofty ideals and balanced views, many in his own country happily equate him with Stalin. And as the Right pushes further from the centre, these viewpoints, festering in the fetid cauldron of the likes of Glenn Beck and Bill O’Reilly on Fox News, gain more and more mainstream credence, and soon, they are talked of as the ‘centre’ ground in a country whose politics are becoming ever more polarised. So, we’re left with a bill, that’s passed with disgust by the majority of Democrats, and amazingly rejected even more so by the Tea Party for its weakness, that ‘saves’ the States, for now. And you almost have to take your hat off for the way the Right fought the battle. They’ve weakened the President, undermined the economy, and a Senate majority, won a bill that’s abhorrent to Democrats, and for them this is just the beginning. And why? Because they’d rather see people on the street over medical bills, bankrupted by mortgage repayments, homeless and jobless, because they see it as their divine right to retain all the wealth they have, at the expense of those who have none. That is, in their eyes, the American way, the American ‘dream’. It’s a disgrace, and no amount of argument, however eloquently expressed, will convince me that the Tea Party is anything other than the politics of the mean. The selfishness of the wealthy over the powerlessness of the poor. Helping those less well off than you isn’t socialism, it’s humanity, and these last few weeks have shown, as if it wasn’t already flashing like a million watt bulb, that these people have none. As a Lib Dem, the past few months have been a living nightmare. And nothing comes any worse than the tumult over tuition fees. I may not be a student any more (those days are long gone) but I understand the dismay that they feel, knowing that in the future, the burden of paying for university will be placed on those that attend, rather than the taxpayer. I also supported the protests when they were announced. We talk a good game in this country, but when it comes to direct action, we’re not always the best at walking the walk. However, it’s been astounding the size and amount of demonstrations, both in London and around the country. The sour taste that sits in the mouth though, and that will continue to do so, is the violent element to these protests. Now trying to unpick the propaganda is easier said than done. It wasn’t hard to see there was a hardline element willing to cause as much damage as possible when they broke away to Millbank, and some of these were aiming for damage not just to the buildings, but the police, or bystanders. And once the police’s underwhelming response was noted, the stage was then set for ugly repercussions. We’ve seen it all before. In the G20 demonstrations, where the Met Police stated that trouble was ‘inevitable’ beforehand, thus giving them the perfect excuse to kick off. We all know what happened that day. And so it came to pass again on the day of the vote. While many students were aiming for peaceful protest, the minority, just like the police’s pre-justified actions, will know that, since violence is ‘inevitable’, then they have the perfect excuse to disrupt and grab all the headlines from those trying to uphold the tradition of peaceful protest. Watching the scenes on tv it was pretty appalling. 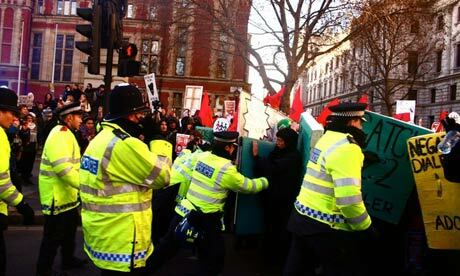 The police stated the protest strayed from an ‘agreed route’, thus justifying their first overreaction. With the violent few then pushing at the barriers, the first baton charge was their pre-prepared reaction, and after that, the rest of the events were almost pre-ordained. Sights of a wheelchair user being dragged from their chair were disgraceful, as were those of a policeman being knocked off their horse, and the barricades being flung at riot police. Seeing Winston Churchill’s statue defaced, and idiots swinging on the remembrance day’s flags on the Cenotaph were flashpoints that will go just as far (especially with older generations) to evaporating any sympathy that students may have garnered over the last months. The students, protesting in a battle they surely knew they’d lose (and did, just). Their futures and those of students that will see the first hit of the new fees in 2012, pitched into a system that puts the epmhasis on mere higher education attendance rather than excellence and focus on academia. 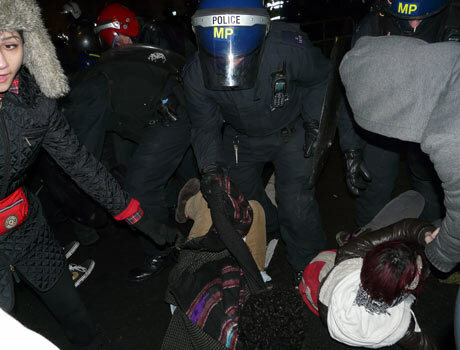 The police, who, while they are often in a no-win situation in scenarios such as this, were brutal, heavy-handed, untruthful, and have shown themselves to have learnt little since the G20 other than to make sure their ID numbers now show as they bring the batons down on the skulls. Mounted police charging a kettled crowd (students, rather than rioters) was shameful, and the myth that protesters (some young kids or old) were allowed out when this wasn’t possible is one that should be exposed. Kettling the last group until midnight on Westminster Bridge was a story that seemed to get scant coverage. It deserved more. The press, who covered in an often hysterical and biased way, reporting on the police hurt and never the students, until much later in the day. What happened to impartiality? 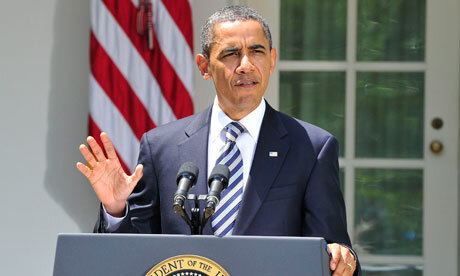 And lastly, the politicians, who through their thinking got us into this ghastly mess in the first place. This may be the death knell of the Lib Dems. Personally I hope (and think) this isn’t the case, but like the case for Iraq for Labour, this may haunt them for years to come. And with the dire economic future showing little sign of improving, this may be the start of a very long, violent winter of discontent. I was depressed but not surprised to see news of a poll this morning that almost a fifth of Americans think Barack Obama, their President, is a secretly pracitisng muslim. More worrying still, in a country where the religion, especially of a president, is seen as a key belief, those that think he’s a Christian has fallen from 43 to 34%. Driven in a large part by the right-wing conversatives, above all in the media (Glenn Beck and Bill O’Reilly, take a bow) it would be almost amusing if it wasn’t alarming. Clinging to the tenet that his middle name – Hussein – and schooling in Indonesia must’ve contributed to this, and the concious feeling that, unlike his very publicly god-fearing (and communicating, if you beleive Dubya) predecessor, he’s not visibily religious enough, those that oppose him politically and ideologically are slowly eroding his image. Most worrying of all, some of those whose minds have changed are his own supporters. With the mid-terms approaching, this is another worrying statistic in a long and difficult term for a president that deserves a lot better from his people and his country. Depending on what papers you read, or what radio stations you listen to and tv stations you watch, today was due to be one of the most important in the last decade of our political history. 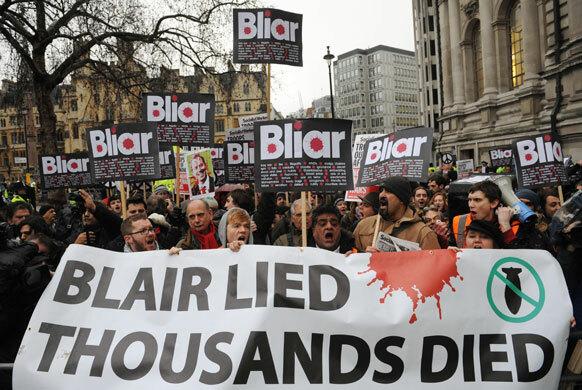 Forget Obama’s one year on, or even his election, but Friday 29th January 2010 was the day that the Chilcot inquiry would get to hear from Tony Blair, perhaps the figurehead of our Iraq ideology and the focus of bile and criticism from the anti-war lobby. Having an ex- (and previous) PM give evidence in an inquiry such as this is unprecedented, and even despite its lack of legal standing or recourse from what evidence was heard, the frenzied build up raised almost feverish hope that we would have our Frost/Nixon moment, especially in light of a recent interview with Fern Britton where he appeared to state he’d have invaded with or without proof of WMD. In reality, of course, this was never going to be the case. Blair, whatever you say about him (and personally his political conduct before, during and since the invasion turned my opinion of him from respected – if not supported – leader to self-important and pious disappointment) was a good leader up to this juncture. One of his main strengths was being able to put his point across, and to debate and discuss, much of which went into his conduct in the run up to the Iraq invasion. He had his convictions, his beliefs, and he stuck to them rigidly. In previous circumstances this was a strength, but this time it clouded his judgement, in the face of advice from the Foreign Office, Attorney General, and criticism from his own Cabinet, not to mention a tidal wave of public opinion, he ploughed ahead, striving to retain the ‘special relationship’ with America, possibly at all costs.Typically, he slipped in a side door and away from the protesters and families of Iran casualties, an action that seemed to preface his performance during the day. What we know now is that we had a ‘dodgy’ dossier, a misleading document that overstated intelligence that was patchy from the JIC at best. What we had was a legal opinion from the Attorney General that right up unto the decision to go to war wasn’t convinced of a legal case for war with the existing UN Resolution 1441. And what we had was a plan for war, but no clear plan for post-invasion. There were clear questions that were needed to be asked today, for us to try and finally get some clarity and give at least the public some modicum of truth and respect on how we came to go to war, and with retrospect, what we did wrong. What we got was another Blair masterclass in bluff and subterfuge, stating his own case, swerving questions and restating his firm belief that he was right. Ignoring whether the intelligence he was given that led him to his ‘beyond doubt’ statement wasn’t strong and if he wasn’t correct in saying what he had, he simply stated that he believed it was beyond doubt. Similarly, he stated that he believed that the case for war was sound, and that the planning for the post-war period was ok (despite multiple criticisms from many parties in the inquiry), blaming it on conditions being different to what had been planned. If regimes with WMD needed to stop using them, why did we not invade Pakistan? China? Korea? It simply isn’t consistent. So many times, his answer started with ‘let me say that….’ where he would revert to pre-prepared answers and statements about, Kosovo, 9/11, Iran, when all we wanted were answers on Iraq. Don’t let’s get too excited here. We knew this was never going to be a career-wrecking day. 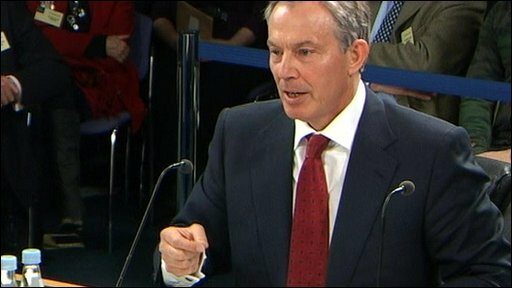 Blair wouldn’t have got where he was today by being careless or carefree (he is, let’s remember) a barrister. But he’s deflected every contentious question, at times almost suggesting in the light of others’ criticisms, that there was no issue (and effectively suggesting by that, that everyone else was incorrect). Batting everything back with a stern defence, clinging to the ‘special relationship’, stating his firm beliefs in everything he stood for, and justifying his actions on this. The only chink of light coming where he admitted his interview with Fern Britton wasn’t worded sensibly, but at the same time, denying that he was wrong. He did also concede that the 45-minute claim wasn’t, with hindsight, a sensible move. For the families sitting in the gallery, that have lost their loved ones in the conflict, this won’t be much closure. If anything, Tony Blair’s performance, while nervous and shaky in the first hour, became more sure-footed, and less revealing as the day went on. The panel made a decent effort of not letting him settle, and after early criticism during the inquiry, they’ve become more steely, but ultimately, with no real legal grounding in their group, they were never going to get one over on the former PM. Yes, with hindsight we can look at many decisions in a different light, but much of this was being criticised at the time, and there was huge opposition evident, but today started full of hope, and ended with weary resignation. I suppose the only consolation is that, however steadfast his outward rhetoric, Blair will have to live with what happened (and is still happening) in Iraq, and there are hundreds of thousands that have lost their lives as a result of decisions he took. This, sadly, is a situation we will most likely face again in this decade. One can only hope we look back at this inquiry and at least use it to colour our actions in the future, or this will have been a pointless exercise. a pedant's worldview in 2008….